I am starting to come to a more moderate conclusion: Given how bad the economy is going to inevitably get, anything we can do to help moderate the crisis is probably the best option on the table at this point. The primary reason is that I don’t think we want to rely on foreign investors to buy our banking assets. Although we clearly must rely on foreign capital through the issuance of treasuries, I would rather have a foreign government as a creditor to our economy than an owner of our banks. Option 1: Let the “market” clear the assets of the banking system. Unfortunately, given the precarious position of U.S. financial institutions and insurance companies (the largest and preferred purchasers of troubled assets) foreign investors and governments are the next logical market-clearing purchaser of these assets. 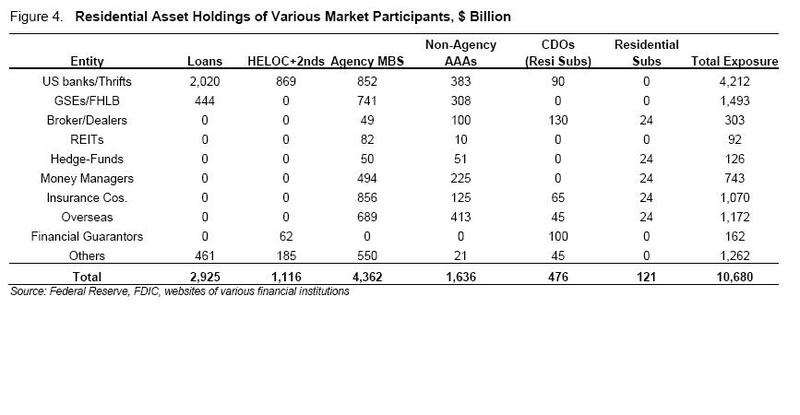 As you can see in the below chart from a Lehman Brothers report written in April, a large portion of the securities in the residential asset-backed security market have historically been purchased by insurance companies and financial institutions, both of which are in challenged positions today. Furthermore, this chart only shows residential asset-backed securities. A similar chart could be created for commercial real estate and other asset classes. Thus, the marginal buyer of these and similar assets will likely have to come from another participant, and it seems like foreign buyers are next in line. Option 2: Clear the market ourselves. The government already tried an indirect form of this approach, through increased liquidity (low rates) and direct funding (borrowing window), but last week showed that this approach is not working primarily because the would be facilitators of said purchases are under so much pressure themselves. Thus, Mr. Paulson has proposed the next best alternative: the U.S. Government becomes the market clearing mechanism. Although this clearly flies in the face of so-called “free market” economics, we should not continue to bang our heads into the glass door, pointing at our obviously flawed text-books as a rationalization. It pains me to see it come to this, but given the prospect of a troubled financial system even *with* the bail out, I am not sure that we want to see how bad things would get if we left things to their own devices. It is certain that the long term consequences of such a move are unknown and unknowable: there has never been a world like the one we are in today. And concerns about oversight mentioned in the above-linked post are surely important, as is the prospect for moral hazard if equity holders in existing institutions are allowed to remain in control and profit from the bail out. However, I would much rather experiment with my government in the driver’s seat than leaving it to the mercy of the rest of the world. This entry was posted in Uncategorized and tagged abs, Bail out, markets, risk on September 21, 2008 by Dave. You, sir, are just another run of the mill internationalist. While america could have had a stable, internally ballanced economy, the meddlers insisted that looking beyond the internationally recognized bounds of this nation was the way to prosperity. Relying on a model where free trade was a cover for store-front front companys that brand label cheap foreign goods to foist on an uninformed consumer public is one cause, the other is allowing foreign interests to have a stake in public policy. Interdependance, that saw of the internationalist, seems to be the rope that the american public will hang from. Flawed text-books, indeed. What school did you graduate from?